Learning to read and write is one of the core goals to be achieved within the first years of school, an agenda that has increasingly been pushed down into preschools. However, preschools and schools have different understandings of children’s development and learning, and consequently different educational practices, pedagogical activities and even material conditions. Drawing on Mariane Hedegaard’s elaboration of a wholeness approach to children’s learning and development, this chapter presents a study from Chile of the development of a motive orientation of Samuel during his transition from pre-school to first-year primary. The analysis reveals that while learning was progressively established as a leading activity for Samuel, in this process Samuel and his classmates encountered a series of institutional demands related to grade based academic achievement and control that hindered their possibilities for engaging in literacy learning activities. Under the restricted literacy learning activity setting, children’s engagement was primarily aimed at fulfilling the requirement of the pupil’s position, which has more to do with performing following a set of strict rules and orders, than with developing a motive orientation to learning, such as, exploring and understanding a new system of knowledge communication. Bröstrom, S. (1992). A Cross-cultural, ethnographical and comparative study of one Danish and one American kindergarten plus the psychological development of these Danish and American 6 year old children. Copenhagen: Royal Danish School of Educational Studies. Retrieved from http://eric.ed.gov/?id=ED369478. Hedegaard, M. (2012). 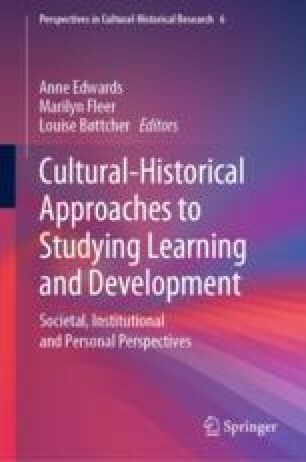 Analyzing children’s learning and development in everyday settings from a cultural-historical wholeness approach. Mind, Culture, and Activity, 19(2), 127–138. http://dx.doi.org/10.1080/10749039.2012.665560. Leontiev, A. N. (2009). The development of mind: Selected works of Aleksei Nikolaevich Leontyev. Ohio: Bookmasters, Inc. Retrieved August 13, 2013, from www.marxists.org/archive/leontev/works/development-mind.pdf. Ministry of Education of Chile. (2005). Bases curriculares de la Educación Parvularia. Retrieved from http://www.mineduc.cl/index5_int.phpid_portal=47&id_contenido=13293&id_seccion=7633264&c=1.